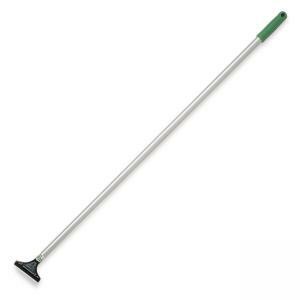 Light-duty scraper with long handle is ideal for removal of gum and wax buildup on floors, sidewalks and walls. ErgoTec Scraper has an ergonomic handle that fits neatly in hand. Reversible carbon steel blade has blunt edge for hard surfaces and razor edge for paint and tape removal. Scraper uses 4" reversible replacement blades (sold separately). Handle attaches to all Unger poles for high access cleaning.